Brussels, locked within an enclave of the Flanders Region, has developed a service economy with 88% of all jobs being in the services sector. The growth in the services sector has been due in part to its status as the Capital of Belgium, the Capital of Europe and also its history of expertise in banking transactions, chocolates, beer and pharmaceutical research. Although Brussels is only home to one tenth of the population of Belgium (10 million inhabitants) it contributes to one fifth of the national GDP and its 550,000 jobs account for 17.7% of Belgium’s employment. 2,000 foreign companies have offices in Brussels. With 19 communes, a federal government and regional governments, Brussels employs thousands of councillors, clerks and administrators every year to service the Belgian government alone. In each commune there is a mayor and a cabinet and decision-making is highly decentralised to these 19 administrations, which has given them autonomy as well as created jobs. On top of this, Brussels has become increasingly important as the city where European Union activities are based and decision-making takes place. Over 40,000 jobs are dedicated to the European Union, which includes the European Parliament, the Council of Ministers and the European Commission are all based in the European Quarter – it stretches from the eastern edge of the city at Schuman to Place du Luxembourg near the centre of the city. Apart from diplomats, journalists, lobbyists and non-governmental organisations have all set up their bases here to take advantage of the centralised location. 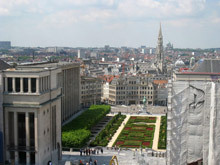 Furthermore, Brussels has been the hub of international banking transactions since the establishment of the Société Générale de Belgique in 1822. Since then, Brussels is the home base for international banking transfer and clearing companies such as Swift, Banksys and Euroclear. The stock exchange (Beurs / Bourse) is well respected, there are 60 banks with offices in Brussels and a spin-off ICT industry has been erected to service the needs of the financial transactions industry. 4,500 ICT firms have offices in Brussels employing 75,000 people. The Brussels Stock Exchange is in the centre of the downtown business district near metro station Beurs / Bourse and De Brouckere. It is an imposing building with Romanesque columns and large steps that make it a common meeting point for people in the city. As a services-based industry Brussels also has expertise in brewing some of the finest beers including 450 varieties of beer including popular fruit beer kriek (made from cherries). In Brussels, beers are served in all restaurants, cafes and bars. Brussels also produces 172,000 tons of chocolate every year and its world renowned brands of praline chocolates Neuhaus, Lionidas and Godiva can be purchased in many countries and are usually the most expensive. A lessen known industry is the thriving pharmaceutical and health research industry which includes biotechnology research. There are 3,000 life sciences researchers in the city and two large science parks: Parc Da Vinci and Erasmus Science Park. The health sector employs 70,000 employees in 30,000 companies. There are five university hospitals, a military hospital and more than 40 general hospitals and specialist clinics.